Young Buddha, B&W oil on canvas, 30 x 30 in. So, welcome, enjoy and I hope you find something that will enhance your journey as an art educator! More about the author of the blog, Eric Gibbons, can be found HERE. Art teachers can join my facebook group HERE. I have some pretty strong ideas about what should and should not be in an art classroom. Some you may like, some you may not, but they come from honest reflection and experience. Bottom line, a public school classroom is not an open studio, it is, or should be, in my opinion, a place of directed, creative , connected education. Though certainly the creation of artwork is what most people see, it is the act of problem solving through a physical form where the most important activity takes place: creative assimilation of knowledge, and learning. This can be done in MANY different and valid ways: TAB, traditional methods, crafts-based, culture-based, fine art based, organized by media, by movement in history, or by what the teacher wants to explore. 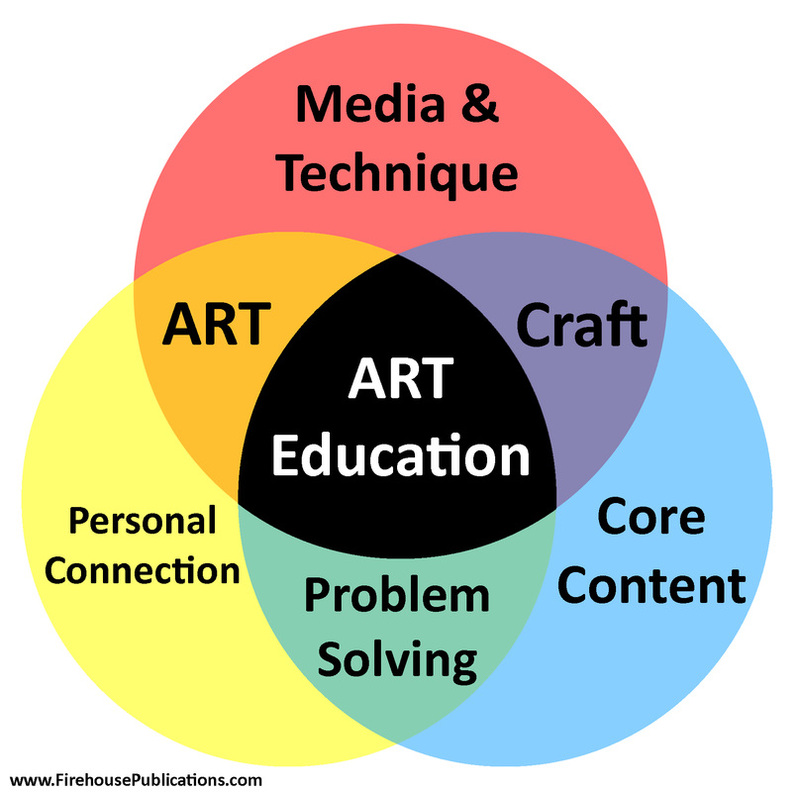 There are as many approaches as there are art teachers. The fact is most students we see will not become "artists." The skills they learn however will shape their lives. The best lawyers, bakers, politicians, soldiers, scientists, etc. have one thing in common, the ability to solve problems creatively. This is what art does in a way no other subject does. Art in our public schools must do two important things. 1. The art project must connect to the child's life experience or point of view. When projects do this, students succeed. Art teachers know, when we grid, measure, and draw—we use geometry. When we make sculptures—we use engineering. When we mix colors—we reveal information about physics. When we create illustrations for stories—we learn about literature. When we review the styles of art from da Vinci to Banksy—we teach history. When we teach ceramics—we teach chemistry. When we write about art—we strengthen writing skills. When we create works of art, we solve complex visual problems in creative ways. Art is the meeting place of all subjects. Art can be a great means for students to get a deeper grasp on their subjects and the connections between courses. Research shows that students who take art succeed at higher rates than those who do not. In the U.S., art students score, on average, 100 points higher on their SATs. In my own district, using our methods, our students scored 155 points higher on average than students who did not take art in 2013. Does this "connected-ness" makes the projects any less "artful" or less expressive? No. It means there will be a level of depth built upon the work of your colleagues and reinforced by the art teacher. More knowledge is always better. We already do this, it's a matter of making these connections more overt, for the sake of our children, ourselves, our department, and our schools. Does this mean crafts are not of value? No. Crafts have connections to cultures, social studies, and history. They can be a rich source of learning IF we make these connections in a meaningful way by incorporating reading and writing skills, and teaching about the cultures and history of the crafts we expose our students to. So everything is okay in the art room? No. There are still thousands of classrooms across the country doing "art" that minimizes our profession, reinforce the idea that art is frivolous, expendable, filler. These programs waste opportunities for learning and problem solving. The hallmark to poor programs are large amounts of "cookie cutter projects." When projects line a hallway that look like little reproductions of a teaching sample I cringe at the lost opportunity. No matter how cute, how appreciated, how loved they may be, they come at the expense of our profession. Leave these for classroom teachers looking for filler. Help them if you like, but such projects have no place in a valid art program. I don't care if the child is two years old or twenty, art must be personal, expressive, and connected. To those who say these cookie-cutter projects build the skills to be used later, my reply is do it NOW, while they are under your professional direction. It need not be dramatic, or profound, but the element of student choice, and connections to core content must be present in all projects to be valid art experiences. Sure but how about an example? Paper Plate Fish: Cut a pie slice from a paper plate, re-attach it to the opposite side of the plate, and you have a fish. Paint, decorate, etc. If you limit paint to a few choices, which you should anyway for the very young, you end up with a hallway full of delightful, but vapid fish. Each like the other, little distinction or expression. Solution: Have students reflect on their personality. Are they loud or quiet? Are they active, still, or lazy? Cut the mouth of your fish to show what a big mouth you have. Make a tail to show how active you are. This tiny alteration has changed the cookie-cutter fish into an expressive, albeit simple, work of art. How about those Core Connections? A: Before making fish, show different kids of fish and organize them by type, air breathing, and water filtering perhaps. B: They can write about being loud or quiet, fast or slow, energetic or lazy. C: They can make a list of all the water animals they know for a few minutes, organize them by order. Speak with your colleagues in other disciplines and coordinate a little. They will respect you more, students will learn more deeply, and succeed at higher rates. ...And how about the Common Core?!? My approach is to create more overt connections to core content with vocab, writing, reading, interpreting, observation, recording, etc. When I do a unit on gridded portraits, we discuss scale. Before we make art, we write about our ideas, creating lists, assimilating information, and include some expository writing. When we talk about da Vinci, we cover the Renaissance, the 1400s, and the history of that time. When we illustrate stories, we talk about the work, the author, and the literature. My "approach" does all the things common core is meant to do, but goes beyond, and is more successful. So though I am required as a New Jersey teacher to follow Common Core, and I do, evidence shows my department exceeds expectations because of our "STEAM-like" approach. As I said before, in 2013 our students did 155 points HIGHER on average on their SATs... and we don't get a lot of "AP" kids that might artificially skew our numbers. It's a proof of concept that's hard to argue with. This info-graphic attempts to dissect why and what it is we do, and maybe where your own class is. Red is "Media and Technique." Alone this category would represent house paint and a good brush stroke, rope and trying up items on a boat properly, utilitarian ceramic works, or a well made wood stool. Yellow is the individual being considered in the process, the potential for personal connection, internalization of the information, media, and technique. Purple are formula projects, "make and take," with little, if any personal expression. Hallways are lined with the work, one looking essentially like the next. It is also the realm of craft that helps to define/express a culture, or decorative items for holidays and special occasions. Orange is the artful program with lots of expression but fewer connections to core content. It's "art for art's sake," like an open studio, like an island in the school with little connection to anything else. It is also how most professional artists work, so many teachers see this as a model to follow to create little Rembrandts. Both orange and purple have their advantages, and many art classes operate out of these realms. Green is where a good core content class helps students understand content by personalizing it. This might be with questions like, "What percentage of your body is made up of water, and what weight would that represent?" Or "If you were Bilbo Baggins, in The Hobbit, when would you choose to reveal you had found a magic ring, and why?" Or "Compose a poem to take the place of The Jabberwocky in Through the Looking Glass." It's internalization of class content for deeper understanding. BLACK, the middle section is what I strive for, and when I do, I see some amazing things happen. Students make connections between content areas, explore them with more depth and understanding, and create more meaningful, insightful works of art. This is the Heart of a great art program, but certainly a difficult balancing act. One needs to take the time to plan both the personal connection and the relevant core content information. Purple Mode: Teacher shows students an inverted pinch pot turtle, glazed green, with little appendages coming out from the bottom. The example is what they will create step by step, pinch a bowl, add the bits, color it green. All students know, "the good ones" look most like the teacher's sample. Parent's love them, so cute! Orange Mode: Students are given clay and taught how to pinch a pot, then asked to "turn it into something creative" that speaks to their personality. Books or images of other pinch creations may be available to flood students with ideas. Some are stumped with too much choice, but most do well and have fun creating their personal expressive artworks. Central Mode: (With 6 or 7 potential core content connections) Students do a bit of writing about who they are, maybe a list of 10 words to describe themselves. (WRITING) Then they connect each word to a possible animal they think best represents that word. (INTERPRETATION) They create a sketch of that animal to scale. (PLANNING) They learn about Oaxacan carved animals, Haniwa animals, or some other culturally or historically connected touchstone as a reference. (HISTORY) Sketches are redrawn before learning how to properly pinch their sculpture. They cut and weight lumps of clay to get 1/4 pound (MATH) and create their work. The project concludes with a critique, and a few written lines about what they did best, worst, and what they could improve if they did it again. (More Writing) If they also learn about the composition of clay or glazes, you can add CHEMISTRY to the list of connections. Time may be your enemy if classes are short, but one core skill can be added to a project to get it into that central mode, be that a little writing, measuring, or historic content. Studies show that students who take four years of art in high school score 100 points higher on their SATs than their peers. That's awesome, but my own students have scored as much as 155 points higher on average. I credit that to my integrated approach (That central mode). Those kinds of numbers, if shared with your administration, can save your program, save your budget, and get you the respect you deserve.